21 Chapters in John’s Gospel – why? Why are there 21 chapters? Might it have something to do with 7 times 3? Seven being the days of the week which come from the seven spheres of the esoteric geo-centric solar system (moon, mars, mercury, jupiter, venus, saturn, and sun). And three is the number of the Trinity. Three-ness is reflected in the three great heavenly hierarchies within which there are three sub-hierarchies (seraphim, cherubim, thrones; kyriotetes, dynamis, exusiai/elohim; archai, arch-angeloi, angeloi). Nine hierarchies from 3 times 3. Thus, 21 chapters to reflect 7 times 3 makes sense. But like all esoteric works, there is much more here to this layout. The middle number of 21 is 11. What is in chapter 11? 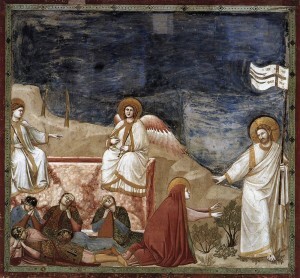 The Raising of Lazarus. Since this gospel was written by one who was able to witness what was written, it begs the question was this gospel written by Lazarus? What kind of death did he suffer? Read again what the high priest prophesied after this event. What historically and traditionally took place within the Holy of the Holies, Initiation, had just taken place in public. Revealing secrets of the local Mystery meant death. Christ would be put to death, would become the sacrifice, but he had brought to an end the old way of initiation. And Lazarus, what happens to him? He becomes the beloved disciple and takes on the name John. There are ten chapters before and ten chapters after. Given that the first chapter is a prologue and the last one is an epilogue, then one could say that there are nine chapters for the nine hierarchies spiraling in to chapter 11 and again nine spiraling out after the Raising of Lazarus. And even more depth to 21 chapters is found when we find that there are seven signs, seven “I am” sayings, and seven agapes. These do not line up by chapter; rather, the seven signs occur in the first 11 chapters, the seven “I am” sayings occur in the middle third, and the seven agapes appear from chapter 11 to the end, chapter 21. [Note, the word agape and expression “I am” occur in other sentences but not as a significant ‘milestone’.] Again 21 from 3 times 7. The seven agapes are John 11:5, 13:34, 14:23, 15:9, 15:12, 17:23, and chapter 21. 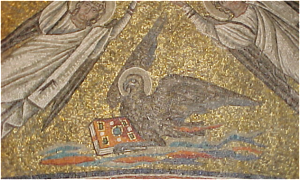 John’s Gospel was revered by early Christian fathers and mystics alike. Not only is its structure deeply esoteric, so is each scene. Let’s examine one such scene of Chapter 20, the Easter scene. The chapter begins with Mary Magdalene coming, “on the first day of the week”, i.e. Sunday, to the tomb where the body of Jesus Christ had been laid. The tomb was owned by Joseph of Arimathea. This Joseph had asked Pilate for the dead body. When he took the body down from the cross, Joseph was accompanied by Nicodemus as secret disciples. They prepared the body according to Jewish customs and placed it in the tomb. This all was accomplished before sunset on Friday as, in these times, the new day began with the day’s darkness. Although John’s gospel does not state this, we learn from Mark and Matthew that Joseph had a large stone rolled to seal the entrance to the tomb. That too happened before sundown on Friday. The next morning, Matthew [27:62] writes that the Pharisees petitioned Pilate to place an armed guard at the tomb so that no one would be deceived by grave robbers that Jesus had risen from the dead as Jesus had predicted. John’s gospel does tell us that Mary “seeth the stone taken away from the sepulchre.” [John 20:1, KJV]. Using a Zondervan Interlinear Bible the sentence reads “sees the stone having been taken out of the tomb.” The verb “sees” is the Greek word “βλεπειν” (blepo). Here is esoteric writing indeed! The meaning can be read both from the physical reality and from the spiritual reality. The stone has been taken away! The mineral element of His body was gone. Mary at this point could only see with her physical eyes and thus could only see the mineral part of His body. But His body was not there – the stone had been taken away or more exactly “taken out of the tomb”! 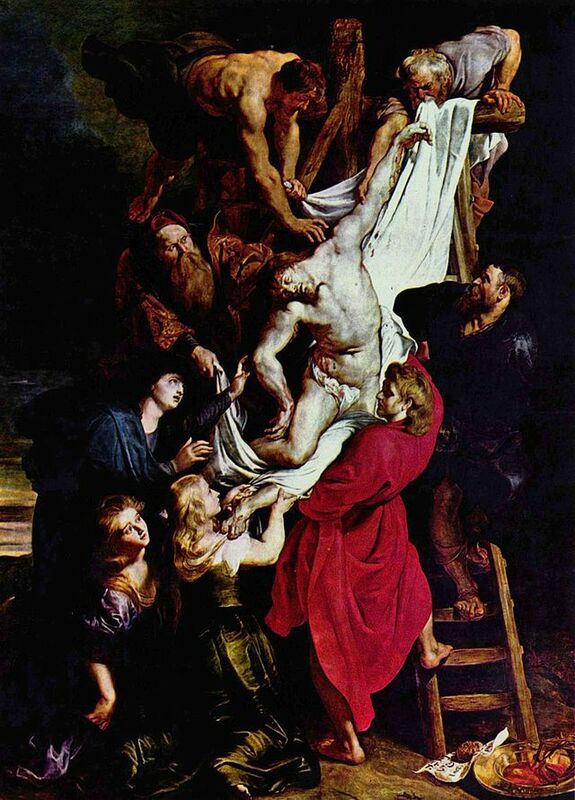 Now I want to reference a deeply moving paper by Jos Verhulst entitled The Esoteric Content of Descent from the Cross (P.P. Rubens 1612). Jos explains John 20:5-6 as a mystery. Here we find the disciple whom the Lord loved sees “lying flat on the ground the pieces of linen” while Peter when he looks, he sees “the pieces of linen lying flat on the ground.” Like other esoteric writers, the writer of this gospel embeds esoteric content directly into the story by using not only imagery but in this case reversing the word order. What has changed from the disciple’s viewing to Peter’s? Is the wording reversal just literary technique? Jos makes clear the esoteric quality herein. Now we come to the description of Peter and “the disciple,” upon hearing Mary say that the rock at the tomb is gone, running to the tomb. The first to arrive is the disciple. He stands outside the tomb and peers in seeing (βλεπειν) “lying flat on the ground the pieces of linen”. Then Peter arrives and with stronger will is able to enter the tomb. The first of the three reversals is that the disciple arrived first but Peter is the first to enters the tomb. This theme will play out in Chapter 21 where Peter will be asked to be the first to lead the Church. Now come the second reversal. 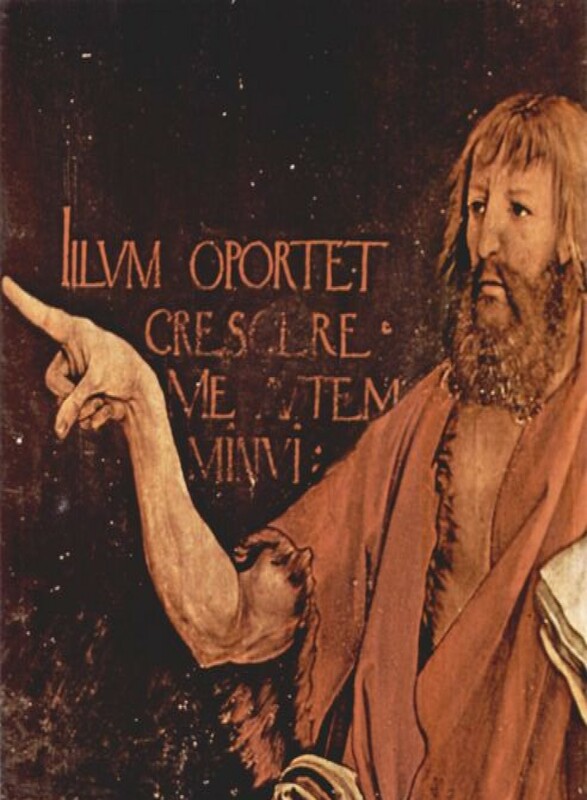 Within the tomb, Peter sees the same things as John saw from outside the tomb but now from a different perspective, namely from within the tomb. Of note, Rudolf Steiner often referred to the physical body as the tomb in which our pre-birth, living thinking is laid. To make clear this change in sight, the verb ‘to see’ changes from βλεπειν to θεωρει (this is the root word for ‘theory’). My Greek Interlinear uses the verb “beholds” for its literal translation. At this moment, Peter is witnessing what reads as a reversal of the physical description. What Peter is perceiving is the next higher level called prana or chi or etheric in spiritual science. It is described in these traditions as reversed in sequence from the physical, as though what one reads left to right in the physical, here in the etheric one reads right to left. Note, Leonardo da Vinci practiced this reversal. Now the two men leave (my Interlinear says they “went away to themselves”) but Mary remains. She is crying at the tomb when she “stooped into the tomb” (‘into’ according to the Interlinerar) and now comes her spiritual awakening as she, like Peter, sees (θεωρει) at this etheric level. She beholds “two angels in white”. One angel is where the feet of Jesus had been while the other was at the head. Jos Verhulst brilliantly compares this to the image on the Shroud of Turin! (I was so excited to read this.) Now Mary performs the third reversal! She reverses her gaze to behold (θεωρει) Jesus standing there. Keep in mind this beholding is within the etheric realm. At this point she cannot understand her perception until her hierophant calls to awaken her to a higher consciousness by using, as all hierophants did, her name. Mary’s initiation is complete. She too can now understand what it is she is experiencing. In this one chapter, we have three different verbs all translated in English to “see”. Impoverished is English in this case to reveal the progression of sight, of spiritual sight in this chapter. John’s Gospel moved from the sight of sensory perception to sight of the etheric realm to sight in the soul realm. Note in the mosaic how all the sheep save the one being touched are looking in reverse. In the next chapter, John’s Epilogue, we again have differentiating Greek words translated to a singular English word. In this case “love” applies to “eros”, “philia”, and “agape” (only the later two appear in Chapter 21). 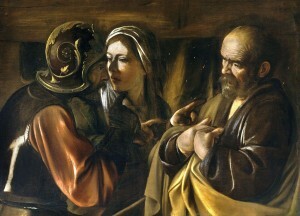 Here Karmic redemption is instantly bestowed upon Peter for his three denials. Christ asks him “do you love me?” three times. The first two questions use the word “agape”. Peter responds with “yea Lord, you know that I love (philia) you.” After each answer Christ makes a request. First Christ asks him to “feed my lambs”. Next Christ requests Peter “take care of my sheep.” Now a third time Christ questions Peter thereby offering redemption for his third denial. Peter bemoans being questioned like this. In this third question, Christ no longer uses the word “agape” but now uses “philia”. Peter’s reply tells of the level of love Peter is capable of, namely Philia, when he says ” Lord, you know all things; you know that I love (philia) you.” Peter cannot stretch the truth and he knows Christ knows the truth even of the level of love in one’s soul. Peter, the rock on which Christ was to build his church, honestly knows, at this time, that Philia, love as in the lover of Sophia, the philosopher, is the heights of his love. The disciple whom the Lord loved, however, was capable of agape. But the world was not. So the church must begin with Peter who first entered the tomb and must wait for a future time for the Christianity of Agape. Has that time arrived?